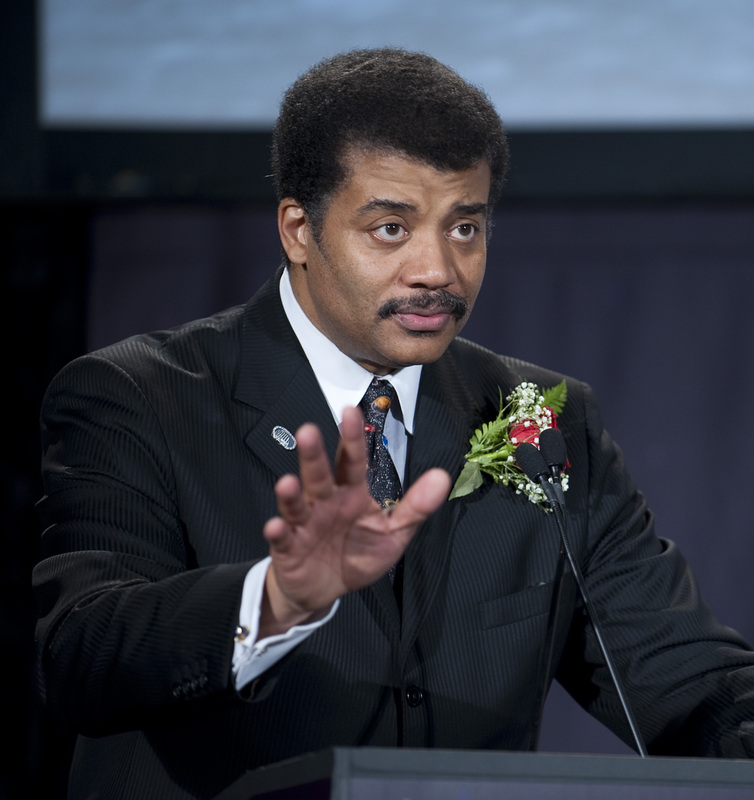 There are basically two scientific rock stars in America today: Bill Nye and Neil deGrasse Tyson. I heard Bill Nye speak when he came to Columbus during my Ohio State days. Last night, I got to hear Tyson, too. His talk was at the Detroit Opera House. (The photo above isn’t from last night. No photos were allowed, and anyway, we were way up in the balcony.) The place was packed, and you should’ve heard these people lose it when he came on stage. I should know. I was one of them. Dr. Tyson opened with a long preamble on various topics, including shameless self-promotion of his books (it was funny), the apparent irony of Cosmos airing on Fox (he actually fell to his knees on the stage – it was funny), and the controversy over Pluto’s planethood. (“Pluto. It’s still not a planet. Get over it.”) He showed us a wonderful letter that some grade-school child had written him, complaining about Pluto’s demotion, and said he had hundreds more like it at home. He also claimed that, although he was in an opera house, he would not be singing. That turned out to be a lie. In between, Tyson spoke on an incredibly wide range of topics. He showed us currency from all different countries that depicts famous scientists and their discoveries. England with Darwin, Israel with Einstein, Germany with Gauss. (He noted that the German bill has a graph of a normal distribution curve on it.) He pointed out that the only scientist on American currency is Benjamin Franklin, and that was emphatically not because of his scientific accomplishments. Some of his points weren’t even science-related. He talked about the sheer audacity of the U.S. dating its independence, not from the date we defeated England, ratified the Constitution, or inaugurated the first President, like any sane nation would do, but – astoundingly – from years earlier, the date when the country’s future leaders decided on paper that they were free. Cool stuff, and thought-provoking. Overall, I found Tyson funny, engaging, and very intelligent. There were some hiccups, though. For instance, after about 90 minutes packed with jokes, he switched abruptly and jarringly to a frame-by-frame analysis of the 9/11 World Trade Center attacks. This included a discussion of the physics of the plane crashes, which felt distasteful, to be honest – especially since it had almost nothing to do with the rest of his talk. I understand that it’s personal for him, since he was there, I just think he handled it in a very weird way. He also went on for an uncomfortably long time about how the Muslim world has made essentially no major scientific contributions in the last 700 years. Not saying it’s an invalid topic, but after a while, it starts to feel like he’s rubbing it in your face (especially, I’d imagine, for any Muslims in the audience). And, to be honest, the overall talk did go on a little long. The whole thing, Q&A included, ran about three hours, which was about an hour longer than it probably needed to. Some of his digressions were interesting, but some felt more like he was just rambling. But I don’t want to imply it was a bad experience, or that I didn’t like him. To the contrary. It was great, I’m glad I went, and he seemed like a smart, funny, and all-around cool guy. My views are totally different than yours, but we have that right don’t we? God gave all brains and none of us use it to it’s full potential. I’m not sure what you mean. Your views on what are different? Thanks very much for the detailed report. 1. The Mathematics Building at my college had no 13th Floor. The math building(!). This may have something to do with why I stopped being a math major. 2. Benjamin Franklin shows up in Mason & Dixon (just sayin’…). Wearing dark glasses, IIRC. 3. I never thought about Independence Day like that. Most of what I write takes place in one country (which doesn’t actually exist), and their Founding Day commemorates the day they turned back the enemy’s troops. That seems to make more sense. 4. The 9/11 thing does seem a little odd. Everybody who was there deals with it differently, I suppose, but I was there (well, across the street, not actually in the building) and I’ve never had the urge to do anything like that. Wow…no 13th floor in a math building, yeah, that’s pretty sad.